STURGIS CITY PARK Announces "BOZ BROS RIDE"
STURGIS CITY PARK--a historic park in Downtown Sturgis, SD--will open for a week-long celebration on the park grounds during the 75th Anniversary of the Sturgis® Motorcycle Rally™. STURGIS CITY PARK will host AMA Supermoto racing, various motorcycle and stunt shows, concessions and live music--all in a festival atmosphere with free admission. STURGIS CITY PARK features a massive paved parking lot for riders for events and activities located inside the park, as well as convenient access to Downtown Sturgis with a short walk or a quick complimentary shuttle to the bars, restaurants, vendors, sponsor displays and all that the Sturgis® Motorcycle Rally™ has to offer. Visit: www.sturgiscitypark.com for more information. STURGIS CITY PARK has announced the "BOZ BROS RIDE"--the 2nd annual charity motorcycle ride--will be hosted by AMA National Racing Champions and World Superbike competitors Ben and Eric Bostrom with members of the multi-platinum hard rock group DISTURBED leading the way as well as celebrity riders, motorcycle legends and industry professionals guide riders on a 50-mile trip through the curvy and picturesque roads of the Black Hills. Limited tickets and VIP passes are on-sale now for the spirited charity ride which will kick off from and return to STURGIS CITY PARK on Wednesday, August 5. Following the BOZ BROS RIDE will be a private party in the main bar of STURGIS CITY PARK. The event will feature a listening party with selected tracks from Immortalized, the long-awaited sixth studio album from the Grammy Award-nominated foursome--David Draiman [vocals], Dan Donegan [guitar], Mike Wengren [drums] and John Moyer [bass]--due out August 21 via Reprise Records. Immortalized follows 2010's gold-certified Asylum, DISTURBED's fourth consecutive #1 album on the Billboard Top 200. After the ride, all participants will also be treated to a BBQ lunch with the Bostrom Brothers and members of DISTURBED. Ride tickets are extremely limited, and all riders must register pre-event day. Proceeds from the ride will benefit the Sturgis Rally Charities Foundation and all riders will receive a special Sturgis Boz Bro's gift bag. Watch the video for DISTURBED's lead single "The Vengeful One", which has already skyrocketed to Top 5 at Rock Radio, HERE and pre-order the album Immortalized HERE. For more information on DISTURBED, visit: http://www.disturbed1.com or http://www.facebook.com/disturbed. 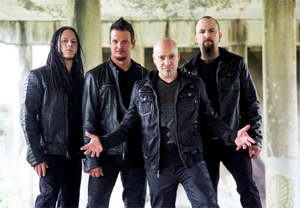 "We're looking forward to Sturgis and the Boz Bros Ride," says DISTURBED. "Good times and a great cause. Live to ride, ride to live. "We're bringing a younger generation to the rally," says Eric and Ben Bostrom. "Sturgis is a motorcycle paradise and anything with two wheels, be it bicycles, motorcycles, sport bikes, cafe bikes, electric bikes, you name it, you are welcome here, that's the Boz Bros style. See you all at Sturgis City Park for the Boz Bros Ride." 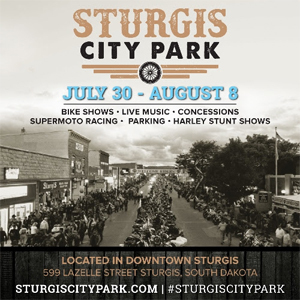 STURGIS CITY PARK 2015 will offer a variety of attractions during the Sturgis® Motorcycle Rally™ including freestyle Harley-Davidson riding demos from UKNOWN Industries, motorcycle industry influencers showcasing their bikes as well as their parts, accessories, riding gear and apparel. Biltwell will host "The Gringo Garage" showcasing helmets painted by more than a dozen top painters in the custom cycle world while ILLConduct's team of riders will entertain crowds with their stunt shows. Metzeler will contribute with the inclusion of the AMA Supermoto "Elephant Run" race on Saturday, August 1 and Sunday, August 2 with riders from around the country racing in front of a crowd of spectators on the one-of-a-kind racetrack built just for STURGIS CITY PARK providing the audience a chance to see quality race action from the world class series live at the park. For a full list of motorcycle shows, rides attractions and more at the STURGIS CITY PARK, visit: www.sturgiscitypark.com. Beginning Saturday, August 1 the park will kick-off a week-long series of daily motorcycle shows starting with the Roland Sands hosted Bike Show, followed with the third annual "Sturgis FXR Only" motorcycle show on Sunday, August 2, then the Biltwell & The Speed Merchant "Dyna Only" Bike Show, Street Chopper magazine "Winner Take All" Bike Show, Hot Bike Magazine "Winner Take All" Bike Show, Baggers Magazine "Winner Take All" Bike Show and the Biltwell & Rusty Butcher "Tracker Only" Bike Show.